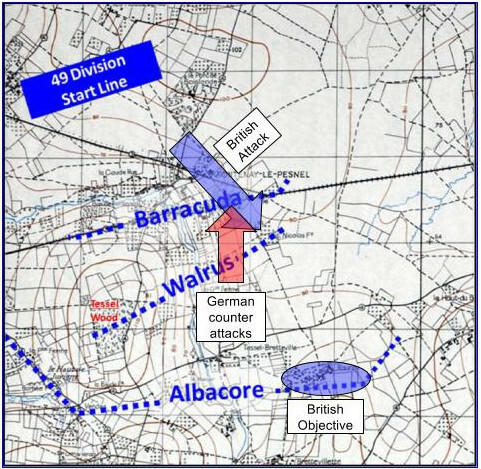 The British attack had been unable to get past phase line Walrus, having been stopped cold at the farm at St Nicholas several times. Now running out of time before nightfall on the second day of the offensive, the resilient German defenders have delivered another localised counter-attack at the British positions in Fontenay-le-Pesnel. The British platoon has 29 men available, so could field three eight-man sections and a five-man command group (2″ mortar, PIAT, platoon sergeant). Their officer is AWOL, so the sergeant will be leading the platoon on his own. The German core platoon has 19 men including their officer, and a Panzer IV attached. The support choices would nearly double that strength. This ground has been fought over many times now (Game 4, Game 5, and Game 7) so is pretty familiar. A road runs from the British end to the German one, with a walled farm compound dominating the centre and a small woods to the south side being another hotspot that has seen plenty of fighting. The British had successfully held off German attacks into this area several times before by using a fairly active defence. I planned to dig in one section with a Vickers gun in support at the forward most Jump Off Point. This should block any German advance through the small woods, another JOP went on the road allowing support weapons to fire down it to the crossroads, and I’d still be able to feed troops into the farm compound if need be. On the German side they’d borrowed a lot of spare bodies to bring their numbers up, as they’d struggled to make much ground against superior British numbers in earlier attacks. Their mortar support would also go a long way towards evening that balance. The ground would dictate the available avenues of attack again: the woods and buildings southwest of the crossroads being the best route. They also wouldn’t struggle to control the farm compound, but moving on from there would be difficult unless the British could be cleared on the other side of the road. German patrols had done well enough to get a Jump-Off Point behind a house on their left flank (near the woods) and they opened play by pushing one of their support rifle teams up into it. This was fairly close to a British JOP and a British section deployed straight to their front and immediately opened fire on them. The British infantry were dug in across the farmer’s field and some of the woods. Bullets whizzed in both directions, both sides were in hard cover but it was very close range. The Brits’ superior numbers, their Bren gun and a bit of lucky rolling saw the German patrol beaten up quite badly in short order, with several casualties and the leader being wounded and knocked unconscious. The little patrol had done their job though, by fixing the position of part of the British defences. From their position a little further back one of the core German squads opened up on the dug-in squaddies, attempting to suppress them while the isolated patrol withdrew. The British force doubled-down though, and revealed the presence of a Vickers gun in their line, which started battering away at anything that popped up wearing a square helmet. This now represented a fairly juicy target for a German mortar stonk, which landed fairly smack bang on the British position. That effectively shut down fighting on that side of the table. The British were now blinded, but the Germans couldn’t advance either. Switching their attack from the left to the right flank the Germans sent a squad into the farm compound, and the British responded by deploying a section of their own, led by the platoon sergeant (who was acting platoon commander). The Germans moved swiftly across the farmyard and into a stone barn, while the British doubled along the outside of the wall and made for the back door of the farmhouse. Kicking the door in they spread out into the battered French building, ready to put the hurt onto the Germans lurking in the barn. Meanwhile, things had been going slightly better for the British on the rest of the table. They had a section and the Vickers under mortar fire, but thanks to their foxholes casualties had been minimal. Under cover of the mortar fire the original German patrol that had first engaged the British were trying to withdraw, having been reduced to a couple of men carrying the wounded Obergefreiter. Unfortunately they’d picked up enough shock to be forced to retreat, and their roll put them right in the middle of a road, where a British LMG firing along the road cut them down savagely, including finishing off their unlucky wounded NCO. This caused several solid hits to German force morale. Eleven men go in, two come out! Both sides had now had an attack repelled, although the British foray into the farmhouse had at least managed to recover some survivors, although with only one sergeant and one corporal left fighting fit out of an 11-man patrol that wasn’t a big consolation. What had been working well for the British was sheer bloody luck; neither team they’d lost had cost them any force morale, leaving them on their starting 10. The British had spent a couple of CoC dice trying to end the turn and the German mortar bombs, but luck again played a hand when a triple six was rolled on the command dice, ending it and putting a stop to all those unpleasant things falling from the sky. The troops under the barrage were still in good shape, and resumed firing at the Germans to their front. Their supporting Vickers gun gave them enough firepower to neutralise any advantage the panzer troops had from their twin MG42s and after the Germans started to take the worst of the exchange it started to become clear to the Germans that despite being fully committed they didn’t have enough men or morale left to push through this strong British line. German force morale was circling the drain on four while the Brits were still on ten and had fresh troops in reserve. Reluctantly the German commander pulled his men out. The stoic British line had held yet again! The British ended the game with a six point force morale advantage, reducing their casualties down to two dead, one wounded. They’d also been lucky not to have any leaders hit during the game at all. Not so on the German side, with 12 men and a junior leader taken off the table during the game, although some of those were from a support unit. The end tally was four dead, three wounded. One of the Junior Leaders also went missing during the withdrawal, and with only one game left in the campaign he wouldn’t be back. First things first: in the last game the commander of the Panzer IV had been recommended for the Iron Cross 1st Class, and word came through from higher up that the recommendation had been approved. A fitting reward, as the same crew (in presumably a new tank) had been effective in this game too, seeing off the British attack on the farm compound. German command was less impressed about the counter-attack being repulsed, and the CO docked a point of opinion. The men were slightly miffed about casualty exchange ratio, but only to the tune of one point. All of this put the German platoon commander in a bit of a funk, and his mood shifted from “thoughtful” to “retiring”, which was starting to have a small negative effect. On the British side the CO buffed his opinion of the platoon by a point, although this wasn’t enough to improve on the +1 force morale roll bonus they were already enjoying. The men were very happy to have given the Germans a bloody nose at relatively little cost and improved their opinion by two points to a total of five, giving another +1 to force morale. I didn’t roll for any change in the platoon leader’s outlook, as he hadn’t fought in the battle. The next game would be the final one of the campaign, so the British had no reason not to use their second platoon. The first platoon had battled through 9 games and walked out with 26 men (although they’d also had 7 replacements on the first day of the operation). The fresh platoon would go in at full strength of 36. As usual, mortars did good work neutralising units, but if they’re dug in casualties are minimal. Moving troops into a building can actually make them more vulnerable if the enemy has heavy weapons. The tank turning up made my cheeky run up into the farmhouse a non-starter and the section got savaged. I absolutely adore your AARs man. Great, great stuff. If only I had someone to play regularly with, so to play a campaign. Another great game report! Reading the bit about the discovery of the Panzer IV really sounded like a WW2 combat report — so many memoirs focus on these little unexpected moments in a battle. I love that the CoC deployment system enables this. So despite the win during this battle, it looks like the Brits may not have enough time left to win the overall campaign? Haha, definitely not. The chance of a win exited a few games back. They’re now playing to try and restrict the Germans to a narrow victory instead of a thumping one. Thanks for sharing your great AAR Andy, like the use of your dug in Brits. You should see the dug in boys a fair bit in the near future. We’ll be going straight into The Scottish Corridor after Martlet and the Brits will be firmly on the defensive.